This post is sponsored by Uncle Steve’s™ All opinions are my own. 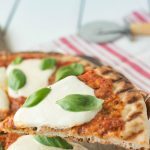 A classic pizza with a summer twist, this Grilled Margherita Pizza is cooked on the grill, and I’m taking this one to the next level by using a really good sauce. Who doesn’t love a classic Margherita pizza? I do, and I’m giving this one a summer twist. Grilling this Margherita pizza makes the crust crispy and taste like it came for pizza oven. When I was contacted by Uncle Steve’s™, a family run, Brooklyn-based company. I could not have been more excited after looking at the pasta sauces they produce. If you know my story, you know I love to make my own sauce. 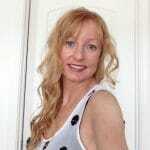 Uncle Steve’s sauces are the next best thing because they do taste homemade with a rich, long time cooked taste. They are made with real, organic ingredients and this is a brand I can get behind and proud to represent. Who is Uncle Steve? All the Soprano’s fans out there will know him well. He played Bobby Bacala, Uncle Juniors shy and big-hearted aide who was also one of Tony’s crew. Steve Schirripa, who played Bobby, started Uncle Steve’s™ as a tribute to his late mother to carry on the tradition of his favorite sauce that she made. Before I get to the details of the pizza, I just want to tell you a little funny story. While I was making the pizza, I gave my husband a spoonful to taste. He then proceeded to start eating it right from the jar! He did this while I continued to cook the pizza and once the pizza was eaten (which didn’t last long). He went on to add the sauce to the vegetables we had for dinner. This is a true story and you see first hand how much the sauce was enjoyed. I used the tomato basil for this pizza which is perfect with the fresh basil. When I make pizza, a good dough is a must. No store-bought dough from a can is allowed here. Please either make your own (you can see how easy my recipes is) or ask your local pizzeria to sell you a ball of dough. The grill is a great place to make a pizza, especially in the hot weather because you don’t heat up the house and grill gets nice and hot which makes the dough crispy and flavorful. 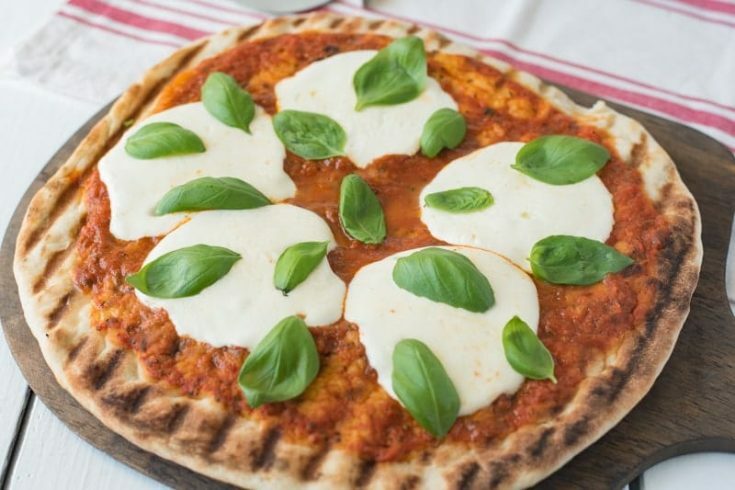 Because this grilled Margherita pizza has large pieces of fresh mozzarella that does not cover the sauce, this allows the sauce to shine through. The pizza comes together as fast as it would from a pizzeria. The fresh dough is added to the grill without toppings, grilled for a couple of minutes before turning and that is when the toppings are added. I’m not a fan of cooking basil on a pizza because it turns black and loses it’s fresh flavor. I prefer it at the end of cooking. If you’re wondering where you can pickup these delicious sauces (and you should) along with pasta and gifts, you can buy them on Uncle Steve’s website. Click here. A classic pizza with a summer twist. This grilled Margherita pizza is cooked on the grill, and I'm taking this one to the next level by using a really good sauce. Add the water to a bowl and stir in the yeast, honey, salt and olive oil. To a clean work surface pile the flour and make a well in the center. Add a little of the yeast liquid and use your fingers to slowly incorporate flour. Add a little more liquid as it is absorbed by the flour until you get a nice dough ball. You may not use all the liquid, don't let the dough be too sticky. Lightly oil a bowl with a little olive oil and transfer the dough to the bowl. Turn once to coat all sides with the oil. Cover the bowl and put the bowl in a warm area to rise until doubled in volume, about 40 minutes. After it has risen, punch down the dough and place it on a lightly-floured surface. Divide the dough into 2 balls. Cover and allow to rest for 20 minutes. You can freeze the other ball for the future. Preheat outdoor grill. It needs to be very hot, like a pizza oven. Use your hands to shape into a 13-inch round and place onto a sheet of parchment paper. This is help to transfer to the grill. Brush the entire top of the dough with olive oil. Flip the dough off the parchment paper and onto the grill, oil-side down for 3 minutes with the lid open or 1 to 2 minutes closed. Use a large spatula to flip the dough. Add the sauce to the center, spreading it in a circular motion from the middle to the edge, leaving a 1-inch border. Place the slices of mozzarella evenly on the pizza and grill for 5 minutes with the lid closed until the cheese starts to melt. Check the underside of the dough, if it’s cooking too quickly move to a cooler part of the grill. Use the large spatula to slide the pizza onto a large cutting board and top with basil leaves. Slice and serve immediately. Margarita pizza is my gold standard for pizza and you have done it’s namesake proud with this grilled version; loving every bite of this one! LOVE doing grilled pizza in the summertime! A great way to do a family favorite without heating up the entire house with the oven. Saving this one for sure! This pizza looks so good! I needed a good change on pizza night! This sounds awesome! I’ve never made grilled pizza before but I have a feeling I would love it. That’s one great looking pizza. We make pizza at home pretty often but I’ve never tried grilling it. I’ll have to try this recipe! Oooh, I love this!! I’d never have thought to grill my pizza like this, but it looks fab and I bet it tastes amazing! Definitely making this next time we fire the grill up! This looks so delicious! I have always wanted to try grilling a pizza! You make it looks easy! This pizza looks amazing! I can’t wait to make it tomorrow. Such a good idea to make it on the grill. need to look for these pasta sauces, too.